An old, outdated bathroom can feel unwelcoming and overwhelming. In addition, it can lack the function and storage needed for modern living. A remodeled bathroom, on the other hand, can make your mornings more enjoyable and relaxing. A custom vanity will enhance your remodel and marry beauty with function to create the perfect space to get ready. And in case that is not reason enough, here are few other things to keep in mind when considering a custom vanity. 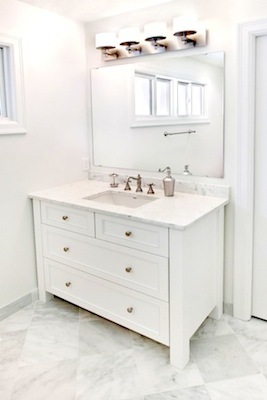 One issue homeowners often encounter is finding a bathroom vanity that meets all their needs. Are there enough drawers? Are the drawers deep enough or do they have baskets? How much space is available under the sink? Is a double vanity too long for your space, but needed for more than one person to get ready? All of these issues can be hard to solve with an out-of-the-box vanity. A cabinet maker can take all of your needs into account and build a custom vanity to your exact specifications and space. Let’s face it—bathrooms are a busy hub in your house. To properly function, they need ample space for storage. Next to kitchens, bathrooms are one of the top spaces homeowners seek to add storage. We see a lot of workarounds from homeowners trying to solve this issue, so we get how important it is to have good (and extra) storage in a bathroom. Along with unique beauty, a custom vanity can provide great organization and storage. A custom cabinet maker can create a taller vanity to allow for an extra set of drawers, or build a center tower between double sinks to tuck away items used daily. You can mix and match drawers, shelves and doors to create the right combination just for you. 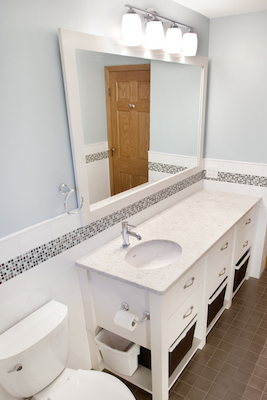 This brings us to our final point: custom vanities don’t have to break the bank. In fact, they can be less expensive than pre-built vanities. With a custom vanity, you don’t have to try to hunt down the right size, saving you time and money. A custom vanity can also save you money because you won’t need to buy additional storage solutions to make a prefabricated vanity work for all your needs. What Would Your Dream Vanity Include? Tell us how you would create your dream vanity! Leave a comment here, or share your pics with us on our Facebook page or on Pinterest. Feel free to also email us or give us a call! You can reach us at 952-737-7088.